1930s map showing (at the bottom) the location of the old (North London line) Shoreditch station. The station was not reopened with the advent of the East London Line taking over the route. Essentially it was replaced by two new stations, Shoreditch High Street to the south and Hoxton station to the north (arrowed is the location for the ELL's new Hoxton station). The location of the old Haggerston station is visible at the top of the map. 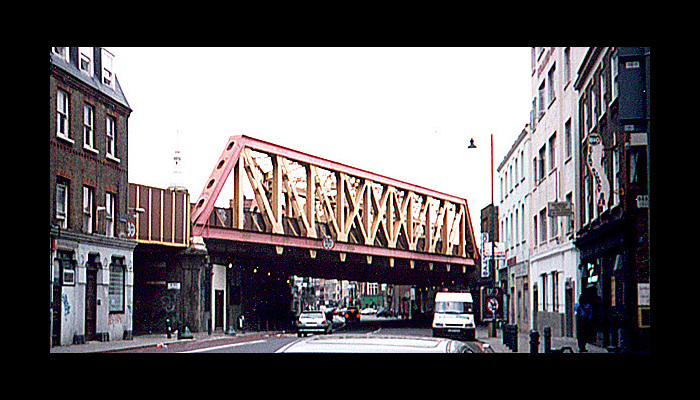 The bridge over Kingsland Road looking north. The entire length of line up to Dalston Junction was built or enlarged for four tracks. The East London line extension has been built with just two tracks. Looking south at the eastern half of the bridge. Bottom level photo (move your cursor over the image space to view it): A new London Overground train crosses the bridge on the day of its re-opening for passengers (27/4/2010) as part of the East London line extension. Heading northwards but looking back south toward the city, just south of the bridge over Cremer St. The junction of Cremer St and Jeffry St is where the new Hoxton station has been built. The bridge over Regent's Canal, in a very sorry (and dangerous) state. This bridge was demolished in mid 2005, leaving only the pillars between the canal towpath and the road, and the brick viaducts on each side [info courtesy of Sam Farrow]. The bridge was rebuilt for the East London Line extension. The remains of Haggerston station, between Lee Street and Dunston Street. It closed in 1940 after bomb damage; the low volume of passenger traffic it had attracted did not justify the effort of repair. The viaduct is very wide here: there were four tracks, an island platform and a side platform - the island platform has disappeared but the southbound side platform still remains (covered with asphalt). The station was reopened as part of the East London line extension albeit built on the north side of Lee Street, unlike the old station seen here which was located on the south side of Lee Street. Southward view from the new Haggerston station of the old Haggerston station. The old platform, as seen in the photo above, is still intact (arrowed). It appears to go off on a tangent to the new tracks but that is due to a different track alignment. The walled section seen here is the location of the original Haggerston station building, damaged by enemy action during World War II and subsequently demolished. Directly opposite (on the extreme right hand side of the photo) is the entrance to the new Haggerstion station building. The southern end of the old Haggerston station has this building at street level. The station building was at the northern end of the platforms but the arch shown in this photo matches the arches of the old station building in design and there are stairs leading down from the old platform to this building.